Secret Empire Reading Order: How to read the Evil Captain America crossover? Big Marvel crossover published between April and September 2017, Secret Empire is one of thoses Universe Redefining massive event. Of course, the most important thing here is that Captain America is a f***ing Hydra Agent! That was unexpected, to say the least, but we knew it before the event took place. So, we are not as surprised as his friends when he made his move and took control of America. Now, the ones who escaped the first assault must organize the resistance movement and fight the occupation. It’s long and transformative, as you may have guessed. Before reading Secret Empire, maybe take a look at the time when we discovered that Cap is a member of Hydra. To do that, you have to read Captain America: Steve Rogers Vol. 1: Hail Hydra, and you can go after that to Captain America: Steve Rogers Vol. 2: The Trial of Maria Hill, and then Captain America: Steve Rogers Vol. 3: Empire Building. You can also turn to Secret Empire Prelude (collects Captain America (2012) #21, #25; Captain America: Sam Wilson #7, #8; Assault on Pleasant Hill Alpha, Omega; Captain America: Steve Rogers #1-2). For the TPBs, go to the end of this article. As always, you can just stick to the solo series, the 10 issues Secret Empire volume. 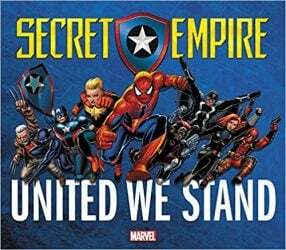 Secret Empire: United We Stand – Collects Secret Empire: United #1, Secret Empire: Underground #1, Secret Empire: Uprising #1, Uncanny Avengers #24-25. Secret Warriors Vol. 1: Secret Empire – Collects Secret Warriors #1-5. Captain America: Secret Empire – Collects Captain America: Steve Rogers #17-19, Captain America: Sam Wilson #22-24. Secret Empire: Brave New World – Collects Secret Empire: Brave New World #1-5. Avengers: Unleashed Vol. 2: Secret Empire – Collects Avengers #7-11. Deadpool: World’s Greatest Vol. 10: Secret Empire – Collects Deadpool #31-35. Amazing Spider-Man: Worldwide Vol. 7 – Collects Amazing Spider-Man #29-32, #789-791. Thunderbolts Vol. 2: No Going Back – Collects Thunderbolts #7-12. U.S.Avengers Vol. 2 – Collects U.S.Avengers #7-12. X-Men Gold Vol. 2: Evil Empires – Collects X-Men: Gold #7-12. X-Men Blue Vol. 2: Toil and Trouble – Collects X-Men: Blue #7-12. Champions Vol. 2: The Freelancer Lifestyle – Collects Champions #6-11. I made an error? Please, tell me in the comments ! Wallander Reading Order: How to read Henning Mankell’s books in order? Scot Harvath Reading Order: How to read Brad Thor books in order? You left out the Ultimates 2, #8, and #9. And you left out X-Men blue #8. Where do these go? Hi, I left out Ultimates 2 #8-9 because they doesn’t seem to be in the story, but I could be wrong, I’ll need to check this out. For X-Men Blue #8, I put it in position #51.